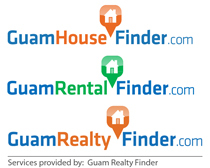 Guam houses for rent are located in most parts of the island. But the most concentration of houses for rent in Guam is located in the village of Dededo. Dededo is the most populous and largest village in Guam. In general the central villages have more houses for rent, followed by the northern villages, and the southern villages having the least number of Guam houses for rent. In terms of prices for Guam houses for rent, there are quite a few variety. At the top of the price range is the super executive houses with every amenity you can think of. The $4,000 to $7,000 per month price range houses would be considered executive homes, with many boasting an ocean view to die for. In the mid price range of $2,000 to $3,000 per month are the moderate size 3 bedroom to 5 bedroom houses with such amenities as nice tile flooring, granite countertops, and updated kitchens and baths. And in the $1,000 to $2,000 per month price range are the standard homes which have the basic amenities. Most of the houses in this price range are 3 bedrooms. Now your next question would be how much space can I get for your budget? Well a standard size house on Guam is about 1,000 square feet to about 1,500 square feet and normally rent for $1,000 to $2,000 per month. Now if you are looking for Guam houses to rent in the range of 1,500 to 2,500 square feet, the normal price range would be in the range of $2,000 to $3,000 per month. And most executive homes in the $4,000 to $7,000 per month price range would be 2,000 square feet or more. As in many places around the world, ocean view houses and beach front houses are well sought after on Guam. Being a small island with lots of coastline, Guam does offer quite a few places with ocean views. Among the ocean view houses on Guam for rent, the ones located in central part of the island are the most sought after. Ocean view homes are not too common in central Guam as most of the ocean view properties have hotels or condos on them. If you are looking for Guam houses for rent with an ocean view, you may want to consider the quitter southern villages, such as Piti, Asan, Agat, Umatac, Merizo, Inarajan, Talofofo, Yona, and Chalan Pago. We hope the information on Guam houses for rent helped in finding what is right for your home. For exact houses for rent, take a look at some specific properties online.